Our on the road tech! Before choosing the charging method (as I alluded to in this post), I carefully considered what tech was needed and what could be done to improve their battery life first and foremost. We have whittled it down to one GPS, one Camera, one phone and one Netbook. Asus 1025C – This was chosen for the battery life of up to 12 hours and compactness. It does everything you could want from a Laptop and should be perfect for working and blogging on the road. Nikon EN-EL12 12v battery charger – This is to work in conjunction with the power bank to let us charge up the camera easily. EasyAcc 2USB 12000mah Power Bank – Only £30 from Amazon, this could charge the GPS 10 times (200 hours of use), the Camera 8 times or the phone 10 times (theoretically 250 days of standby time!). The only thing it can’t charge is the Netbook however this shouldn’t be a problem given it’s lengthy battery life. Nokia 101 mobile phone – Chosen because it’s cheap (£20), supports dual Sim cards (roaming and local sims), 25 days of standby time and it supports up to 16GB of memory so you can put lots of music on it, nice to listen to whilst camping. I also purchased a Telestial Passport SIM for roaming, see more on choosing a SIM here. Garmin Edge 800 – This will mostly be used for mapping the journey on the website and also assisting with guidance It does all the usual stuff of distance, speed, heart rate and lasts around 18 hours between charges. Nikon AW100 – Chosen as it’s rugged, has GPS geotagging, is waterproof and lasts about 330 shots between charges, which could be anything from one day to 2 weeks. From testing so far, i’m very impressed. Terrapin 2pin European 2A USB charger – This is to charge the power bank when a plug socket is available. It’s a 2A charger so will charge faster than your normal USB charger. It could also be used to charge an individual device if required. 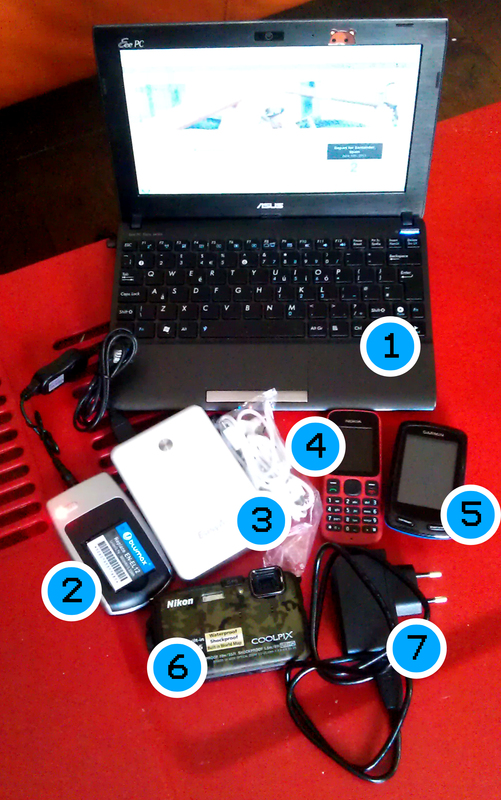 Buying all this tech might not seem very cycletramps however each one is carefully chosen for the job. Plus each item was bought for as cheap as possible when doing so. Look like good choices, but I am not sure you will get 18 hours between charges from your Garmin Edge 800. Travelling from Paris to the Algarve on our last trip I had to charge the Edge every night for a full days riding. Great help on the road mind you. In hindsight you’re probably right- I normally use it for commuting without navigating anywhere or interacting with it at all really and I’ve rarely had to charge it. How many hours did you get out of your Garmin? We are not the quickest on two wheels (!) and typically spent 5-8 hours on the bikes each day. After each day the Garmin had charge left, but not enough to get through a second day comfortably, so it had to be charged every night. However, it was our only map and was used to the full each day. I enjoyed the extra info on distances, climbs, etc. while touring. On a recent trip in Portugal I let it run down by mistake to a point where the low battery signal came on and it froze, needing a factory reset and so losing all my data for that trip. Very annoying! I’d be interesting in knowing how you have got on with the battery charger you mention, Nev.
I’ve run mine down to low battery loads and its not failed. I have just updated the firmware via the Garmin website and it seems quicker now and you get a few more features too. The battery charger seems to work well so far but I’ll update from the road in a couple of months how its all fairing.